Buying a camera is always a difficult choice, with specifications changing on an almost monthly basis sometimes it is difficult to get a grasp on how different models compare. The Action Sports Camera market is no exception with GoPro, Intova and Sealife releasing new cameras a few months ago. If you are looking for a video camera with a small form factor, full HD video, still photo modes and the ability to take it in and around water then these are the brands of camera you should be looking at. I will quickly give an outline I what I feel the Pro’s and Cons are of each cameras and will round off with a head to head review of their full specification. I will be focussing on what makes these cameras good for taking underwater, some are better than others! GoPro arguably invented the action sports camera market with the release of the HD hero all the way back in 2010. GoPro have improved their product line consistently to arrive with their current line of up HERO4 cameras, including the Black, Silver and HERO cameras. The HERO4 Silver is the middle of the line and is the one that I feel is the most suitable for casual film makers who need something that is easy to use but want to capture everything in full HD. The Silver is the most compact in this line up and also has the largest line of accessories to go with it. It is the first GoPro to have a touch LCD screen built right into the camera, without the need for an accessory BacPac. What makes the HERO4 Silver so good for taking diving is it’s low light ability, allowing you to still capture detail even at depth when the light begins to fade. It is also the most flexible when it comes to shooting above water with a range of mounts and accessories which allow the camera to be mounted in any conceivable position. Intova are a Hawaii based company who have been in the camera business since 1995. The EDGE-X is a culmination of all of their camera making experience all packed into a tiny package. The EDGE-X is the only camera in this line up that can trigger an external strobe. A small light on the top of the camera goes off every time you press the shutter button, this can be used to trigger an external flash unit using a fibre optic cable. This is especially useful in darker waters when you want to illuminate the foreground to bring out colours and detail. The EDGE-X is rated to 60m which makes it more than capable of withstanding the depths that recreational divers can reach. A rubberised housing easily withstands the abuse that divers encounter. A removable LCD glare hood means you can view the screen in all conditions allowing you to frame the perfect shot. 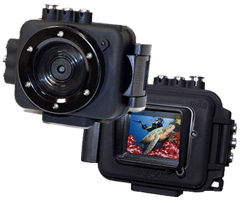 The Sealife Micro HD+ is the first digital camera to feature a completely sealed design. There is no need to worry about maintaining o-rings, simply charge the camera up, jump in the water and go! The Micro is available in two versions the HD and the HD+, the only difference between the two is that the HD+ plus has twice the internal memory at 32gb and Wifi, allowing you to transfer files and set the camera up via a tablet or smartphone. The Micro HD+ is very compact, not quite as small as the other two here, but it fits comfortably in the hand and has a layout similar to a traditional point and shoot camera. A 140 degree wide angle lens allows you to capture images of the whole reef while keep the distance between the camera and subject to a minimum. The Micro HD+ has a total of four diving modes which automatically take into account changes in light when the camera is taken to different depths. The Sealife HD+ is the perfect choice for divers who want low maintenance, an easy to use layout and peace of mind. Which camera is for me? Are you worried about maintaining o-rings? That you may forget to put it in or that a stray hair may break the seal? 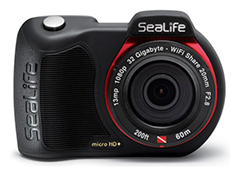 Then go for the Sealife Micro HD+, the completely sealed design means it never needs to be opened and files can be sent wirelessly from the camera to your tablet. Do you take more still photographs than video and want to be able to use an external flash unit? Go for the Intova EDGE-X. The ability to link external flashes means that you can get more professional still images in more challenging conditions. Built in fisheye correction also means you get straight images right out of the camera. Do you need the most compact camera available? Do you require the added clarity of 4K or 2.7K resolutions? 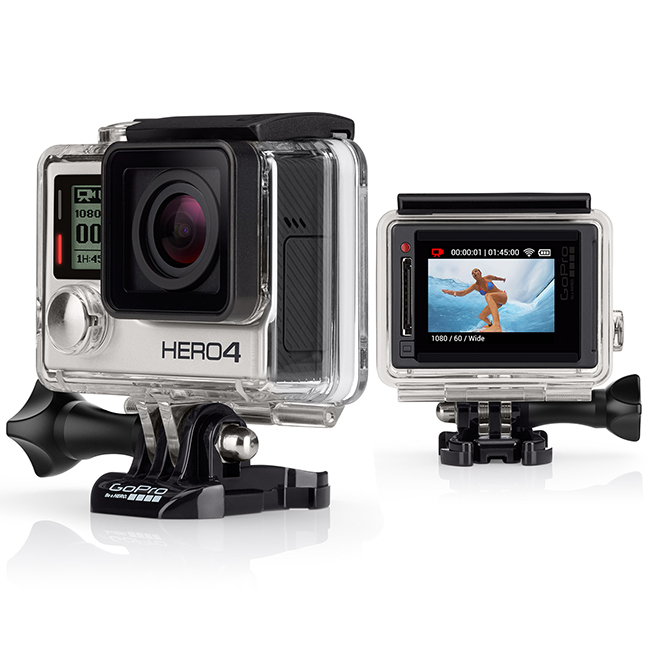 The GoPro HERO4 Silver is one of the lightest and smallest cameras available. A huge range of accessories allow you to mount it in any conceivable fashion to capture the shot you need.